You'll be £10.49 closer to your next £10.00 credit when you purchase Tracing Your House History. What's this? Order within the next 2 hours, 40 minutes to get your order processed the next working day! Anyone who wants to find out about the history of their house – of their home – needs to read this compact, practical handbook. Whether you live in a manor house or on a planned estate, in a labourer's cottage, a tied house, a Victorian terrace, a twentieth-century council house or a converted warehouse – this is the book for you. In a series of concise, information-filled chapters, Gill Blanchard shows you how to trace the history of your house or flat, how to gain an insight into the lives of the people who lived in it before you, and how to fit it into the wider history of your neighbourhood. A wealth of historical evidence is available in libraries, archives and record offices, in books and online, and this is the ideal introduction to it. Gill Blanchard explores these resources in depth, explains their significance and directs the researcher to the most relevant, and revealing, aspects of them. She makes the research process understandable, accessible and fun, and in the process she demystifies the sometimes obscure language and layout of the documents that researchers will come up against. As featured in the Wigan Observer. All of the houses in which I've ever lived, right from 1946, have been fairly modern, so there would be no history attached to them. My wife's first family house, in Kilburn, could have turned up some secrets, had anyone been interested during the time she lived there. This is an excellent reference work, another superb addition to Pen and Sword's brilliant series. The book has enthusiasm for the subject and some very good sections. I was recently given a copy of this book to review and what a delight it was. This book is more than a guide to researching the history of your house, or a house of interest. It is a font of interest if you are seeking to research and understand the social and domestic lives of people and their communities from early times. The book is comprehensively laid out over 7 chapters and gently walks readers and researchers through where to find information. Starting with indexes, catalogues and transcriptions before moving along to finding archives in Records offices, local history libraries, heritage, local and family history organisations and numerous online resources. The section on dating your home and house style is very comprehensive, starting with looking at architects and their role and then moving along to dating a building. This nicely links into the third chapter which features architecture styles across the ages, commencing with Prehistoric through Norman, Medieval, Tudor, Stuart, Georgian, Victoria and Edwardian times. This chapter also looks at Modern homes, before moving onto discuss and provide resources for model villages, Garden Cities and Philanthropic Schemes, new towns and council housing. Also touched upon is the Public Health and slum clearances, why they were necessary and what gave rise to them in the first place along with locating the redevelopment and clearance records. The book progresses to the process of building local knowledge, by looking at local histories, the importance of oral histories, local tales & legends and the foundations they can provide in research. This is followed by two important areas; finding out about local history and then about the resources of Societies, groups and information. Moving on from that is a section that looks at the visuals of such a study; photographs and postcards, along with paintings and drawings which add illustrative social context to your study. Chapter 5 is a very full and comprehensive chapter on resources. Many will be already known to family historians, such as Birth, Marriage and Death records, Parish records, and Census returns. Also included is business and occupation records, directories and gazetteers, Electoral registers and poll books, Fire Insurance records, Glebe and estate records. Various taxes are looked at, such as Hearth, Window and Land taxes. Land registry, deeds, Manorial records, Maps and plans. The National Farm Survey 1941-1943 which is a an often neglected source in family history research, Quarter session records, Land Owner returns 1873 – 1876 and Valuation Office Survey 1910 – 1920 and finally Wills. A real bonus for this chapter is the inclusion of the useful and comprehensive timeframe for each resource. The final two chapters deal with how you can present and write your own house history, but similarly this can apply should you be researching a One-Place study, before moving along to the directory of resources looking at Organisations, Websites and a selected Bibliography. There is an index at the end of the book. All the way through there are illustrations in black and white with links to numerous and various web pages. This book has been thoroughly researched and presented; and I believe it should be considered the book for those researching houses or a One-Place Study. It was a true delight to read and review. Disclaimer – I was provided with a copy of the book in exchange for an honest review. Among the most comprehensive books on tracing house history, packing a great deal of information into just over 200 pages. A complete guide to house history. In giving an insight into ancestors’ lives, the author also considers the effects of death on surviving families and the genetic aspects and importance of the causes of death. There is a useful bibliography and an appendix of addresses for further research. "Tracing Your House History" is a guide to finding out the history of a home whatever its age, size and origins. The image is an endearing one, peculiarly English in a Agatha Christie sort of way with a curious blend of bluff and intrigue. Gill Blanchard, genial genealogist and relentless researcher, is clearly tickled by the memory of the time she briefly became an uncover house historian. I have chosen a book which, on the face of it, does not deal with family history. However, we are all interested in where out forefathers lived and this is a very useful guide. It gives a potted history of domestic architecture, how to date a building and where records can be found. Throughout the text are useful websites, which not only expand your knowledge but will help you to find documents. These websites are also indexed at the end of the book. The last chapter gives suggestions on how you might want to write up and present your findings. A different way to ‘put flesh on the bones’. Intended as an introduction as well as a step-by-step guide, Tracing Your House History contrives to be both an engaging and practical exploration of the seemingly convoluted, sometimes mysterious world of archival research. In a series of concise and easily accessibly chapters, Gill offers advice on how to go about dating your house, how to interpret architectural styles and how to locate and best understand the documentary resources which hole the key to the human histories behind so much brick and mortar. Discovering who lived in your house in the past can be an exciting project, with a wealth of new records to get stuck into – and, of course, learn how to interpret. With Gill Blanchard’s all-encompassing guide, you can also apply these newly-acquired skills of detection to trace homes that your ancestors lived in, as a colourful extra dimension to your family history. Gill explored the local, national and online resources needed to find out who lived in a property when, from census returns to wills to Valuation Office Survey records and beyond. She explains how to build local knowledge through local histories, investigate craftspeople and much more, to better understand the social and architectural landscapes at the time. With its practical slant and focus on demystifying unfamiliar property documents, this is the perfect introduction to tracing a house history, which can only add to your knowledge of your ancestors and their lives or perhaps help you to restore your own home in keeping with the era in which it was built. 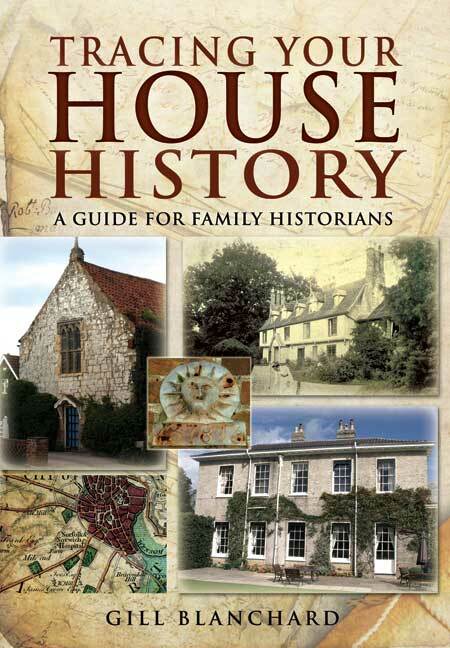 A practical handbook for those researching the life and times of their houses. I was particularly impressed by the great detail the author goes into with each source and how she explains some of the mystifying terms used in old documents. Highlighting the relevant websites as you progress through each chapter is another useful tool, and the ‘Finding…’ part at the end of each section is a great idea, as it can help you hunt down sources with ease. Gill’s text is not only easy to follow for beginners, but also contains up-to-date information for more experience3d researchers. It may inspire those who think they have exhausted all records on a particular house to pick up their notes and try again. With chapters on using architectural features to date buildings and explaining architectural styles from medieval to modern, this book provides a useful introduction on the physical aspects of buildings to the beginner. The book’s strength lies in guiding the reader towards sources of documentary information that will help them, including various maps, many building-related records such as hearth and window taxes, and people, with copious examples and links to the proliferation of web-based information available to researchers. As the number of sources increases rapidly, so does the need for a book such as this to keep us up to date with what is available. An ancestry book with a difference - many of us will know exactly when our house was built, and by whom, but there are still things to be learned about it, and Gill Blanchard opens several fascinating doors into the history and pasts of our homes that will make for fascinating research.